Amsterdam is full of wonderful and exciting places to eat out, with a wide choice of every kind of food imaginable. The many stylish locations and enormous variety of excellent, mouth-watering menus provide nothing short of culinary perfection. Whether you are looking for a romantic meal for two or trendy, lively dining, the only problem is deciding where to go as there are so many restaurants to choose from! There is a selection of more than a thousand restaurants, many of which are in the city centre, and are of high quality. The Leidseplein features a wide range of restaurants and fine dining restaurants are usually to be found in the top hotels. A visit to a brown café will give an insight into the real Amsterdam. The cafés are not cafés as we know them but are pubs whose interiors have been darkened by the smoke of pipes, cigars and cigarettes over a period of many years. There are brown cafés all over the city, varying from very large taverns to tiny bars that rely on a regular clientele. In the brown cafés there is no background music but a very convivial atmosphere where the customers talk to anyone and everyone. Amsterdam has a policy of tolerating the sale and use of soft drugs (up to 5g for personal use) and these are on sale in coffee shops and brown cafés. Hard drugs are strictly prohibited. The majority of Amsterdam restaurants open daily and breakfast is served in most hotels and eateries until 10:00 and consists of a continental-style meal. Lunch is usually between 12:00 and 14:00, with light snacks between 15:00 and 17:00. Dinner is served from around 17:00 to 20:00 and many restaurants close at 22:00. However, visitors wishing to dine after this time can easily find simple meals and snacks in night-time restaurants, pubs and bars. 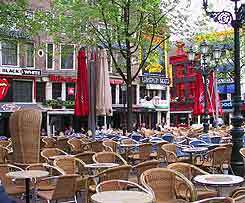 Amsterdammers also greatly enjoy snacks between meals and all over the city there are many reasonably priced snack bars or caféterias opening at around 12:00 until 01:00 offering a selection of tasty fare. Known as one of Europe's liveliest city's for nightlife, Amsterdam offers a choice of entertainment which incorporates everything from high culture to low life. 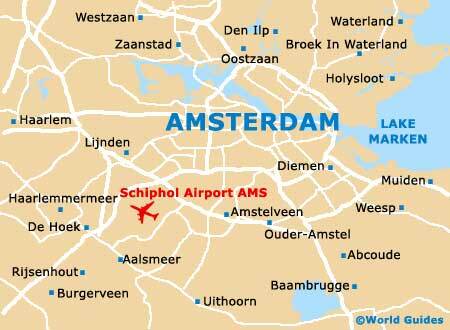 So, whether your personal enjoyment is opera, theatre, cinema, ballet, rock, jazz or striptease and live shows, Amsterdam can cater for your needs virtually around the clock. Most prominent among the main entertainment areas are the Leidseplein, Rembrandtsplein with adjacent Thorbeckeplein, and the Zeedijk.